Help keep your counters, tables, stove tops, or buffet lines clean with this 9" stainless steel spoon rest. Perfect for spoons, tongs, or ladles that are used for cooking or serving, this versatile item serves as a simple solution for keeping utensils close by without dripping sauces or soups on the surface. Good quality. Not as heavy and thick as I would like, but still really great for the price. Stays upright with heavy spoons in it. This spoon rest is a great value for the money: really heavy duty stainless steel, and it does a great job for smaller sizes of utensils. If you're looking for something to hold giant spoons, look elsewhere, but this definitely has a place in my kitchen. I’m so glad I ordered these spoon rest especially when we do buffet self serve at an event... they keep the table looking neat all evening! Great Buy! Inexpensive, yet good quality spoon rest which works well with many different kitchen utensils used during stir frying including spoons, ladles, and spatulas. The one piece design means it is easy to clean. It has a rounded cup, which is a bit wobbly. Bought this for our cafe so we could rest our tiny ice scoop on the counter above our ice maker, since the scoop would get lost if we placed it inside the ice maker. Does the job and is attractive alongside our other stainless steel equipment. This spoon rest fits my needs perfectly and is very easy to clean. It can hold multiple kitchen utensils as well. The slight lip on the back allows it to hang on a drying rack needed. Great addition! This spoon rest is Great! It helps keep my stove top clean. It's a pretty big size so I can fit multiple spatulas on there. Great price for a great product! Very large spoon rest. Not only does it a hold a lot of things, but it is easily cleaned and lays flays against the stove top. Pretty good product! You could use this spoon rest directly on your stove top since it is stainless steel. However, I wouldn’t recommend setting on a glass cooktop because it could scratch it over time. This has a very large, deep bowl, so you can use it with spatulas, spoons, and soup ladles…coordinates well with buffet equipment, but it does stake up a large footprint. Not sure why some reviewer give this product a low rating. We love this spoon rest! It goes with almost all kitchen and the stainless steel quality is good for what it it is. Easy to clean and it's even dishwasher safe. Perfect for long handle spoon. unfortunately these have quite a lot of imperfections. For the price i decided to look past them because they do work as intended, the look just isnt quite as nice and uniform as i was hoping. they are decent in weight at least. for a value price spoon rest, these are fine. wow, nicely done. The 9" Stainless Steel Spoon Rest #407SP9SS is very large and even holds my ladles and a few spatulas/turners. This is an awesome item that helps so much and causes less gross on my stove top while cooking and keeps spoons more sanitary than touching the stove top in between stirs. This is a solid spoon rest - it's big enough to hold my fat, wooden spoons as well as my bigger whisks without letting mess drip off. Easy to throw in the dishwasher when it needs a clean. Only four stars because I am not fond of the small 'foot' piece on the extended part of the rest - it's easy for it not to sit well on a flat surface and kind of rock a bit. We got these to use on our buffet line. The hold even our larger spoons without an issue. I like that they match out chafing pans so everything has a consistent look. This is a large spoon rest and can hold several spoons at once. This is easy to clean and sits flat on the counter or stove. The 9" Stainless Steel Spoon Rest holds large serving spoons and other utensils that a standard size spoon rest would not hold. It is easy to clean and definitely met my expectations. Great, simple spoon rest. Deep bowl holds a lot of liquid and securely holds utensils. Makes cooking easier with less countertop cleanup and the stainless steel is easy to keep clean. I needed spoon rests and silver stainless matches with our platters, chafing dishes, and other buffet serving equipment. These rests work fine, but they aren't as elegant as I was hoping. They are a bit clunky and their large size can be challenging to fit onto a crowded buffet. One of the unsung heroes of my catering service display. Big enough to handle implements from tongs to ladles with ease. Reduces the busing of debris & drips by a wide margin & permits staff to concentrate on more important issues. Really well designed & built, it nicely compliments the serving piece resting within it. Great quality, SS finish matching the rest of the service & super price-point. Order this rest with confidence. Good shape for spoons but works okay for spatulas and turners too- it's good to have on the stove since it is stainless steel and not breakable like ceramic ones are so dropping lids or spoons on it is not a problem! This is a quality made product, solid and holds every utensil I use on the stove. I would recommend this to anyone looking for something that is easy to clean. I ordered the nine inch stainless steel spoon rest for the first time, since we have never used this particular size before. After experimenting with it for multiple dishes, now I would absolutely recommend them. It works very well for solid and slotted serving spoons as well. The design is flawless and I will order this again. Not much to say about this stainless steel spoon rest besides that it's affordable, looks nifty, and is surprisingly handy. Instead of getting a plate or bowl dirty, I just leave this on the counter when cooking to rest all my utensils on. this spoon rest has a nice raised back so that spoons don't tip or slide off and the stainless steel finish is great for making it easy to clean and not rust. The 9" Stainless Steel Spoon Rest works very well. The quality is excellent and the price is as well. I really like that it holds my large spoons unlike other spoon rest I have had. Highly recommend! Well constructed, non-rusting and with a nice, large resevoir, this is a great spoon rest whereas some others leave you with a major cleanup given a much smaller size. On the days we serve gyros, this spoon rest is just the right size to hold the spoon my kitchen worker uses for the cucumber sauce in the fridge. The built in hook on the bottom hangs from our wire shelving when not in use. This is the first item I've bought that my ornery kitchen worker has actually thanked me for, lol. This stainless steel spoon rest is perfect for my needs. It is large enough to handle even large Sunday Sauce spoons without any spilling over the edge. Good spoon rest for any utensil with a flat handle. Not great for round handled items because they tend to roll right off the spoon rest. Bought these for a chili picnic...they are great! heavy duty, easy to clean and can hold several spoons or utencils at the same time! Heavy duty! This spoon rest works very well in our home. It is sturdy and large enough to fit any of our spoons or cooking utensils. I'd recommend. This stainless steel utensil holder works great, the material ensures no cross contamination or staining. The design and length of the spoon rest allow for multiple sizes and shapes. I love this spoon rest! It goes with my kitchen and matches all my stainless steel kitchen appliances and is extremely easy to clean and even dishwasher friendly. After one use, these supposed stainless steel spoon rests, rusted on the bottom and the top. I will never order them again! An absolute waste of money. I purchased 5 of these to have around my kitchen for cooking utensils as I lay them down. Wow, what a bargain. They are a wonderful size too! Not at all small and flimsy. Great product. This spoon rest comes in very handy around the kitchen. Even very long handled spoons and spatulas don't fall out of it. It is fairly thick and heavy for the price and is stainless steel so easy to wash. This is a very standard, no frills spoon rest. It was a little bigger than I anticipated, but it's very, very sturdy. And easy to clean. Glad I bought it. I initially brought several of these to place in front of chafers, and it worked very well and was very pretty and prevented messes on the table. Now, one sits in the middle of my stove at all times. I use it while cooking to rest utensils on. It help keeps the mess of sppons and cooking gadgets in place while in use. They wash well in the dishwasher too. Great spoon rest. A little big for the top of my home oven, but it accommodates everything from a ladle to a simple wooden spoon. I love that it's stainless steel, I can throw it in the dishwasher without worry. 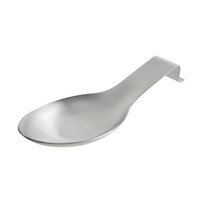 We purchased a few of these for the serving spoons for our chafing sets....they are a lighter form of stainless steel than others I have but these are really nice and the price is a whole lot better..I am very happy with the quality of them. These spoon rests are perfect to place used spoons. I could place about 5 different spoons in one place. It is sturdy and does not tilt even when I place a lot of spoons on it.